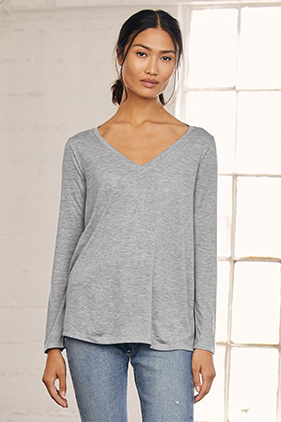 This elevated long-sleeve tee is constructed with exceptionally soft poly-viscose for touchable softness and a flattering drape. 65% polyester/35% viscose, 32 singles 3.7 ounce flowy long sleeve v-neck t-shirt. Side-seamed, Relaxed, drapey fit. Lightweight and airy. Hits at low hip, with side seams and a deep V-neck. Athletic Heather: 52% polyester/48% viscose.